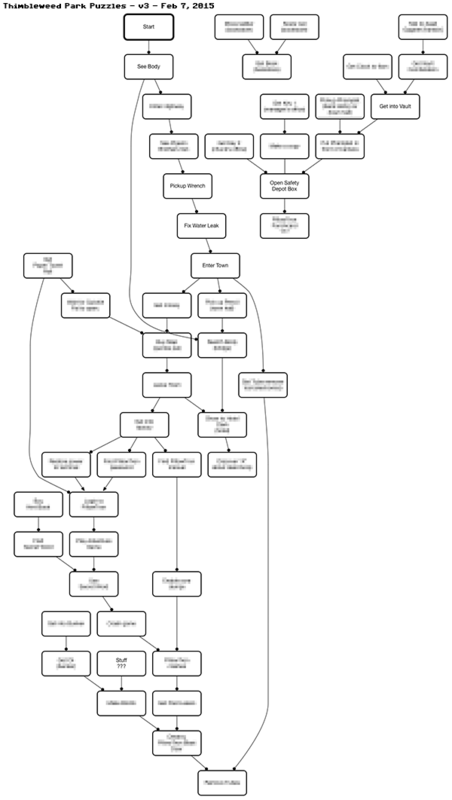 I spent much of last week working on the Thimbleweed Park design, so not a lot happened in the code. Gary and I spent the time putting together the map of the world showing all the locations, or "rooms" as we call them. I'm not sure why the term "room" crept into my lexicon for describing locations in adventure games. I don't know if it was because Maniac Mansion took place in the mansion, so it was natural to describe them as rooms, or if the term originated in early text adventures. SCUMM called them rooms and many of the commands used that word and it's just stuck. As we've been putting together the puzzles and story, Gary and I have been keeping a big list of all the rooms in the game, but last week we finally put them together in map and starting making all the connections. Having a list of rooms is one thing, but when you see them all connected together, your brain (or at least mine) can start building an image of the world. Seeing them all connected together also points out problems with bunching or choke points. An adventure game world should open up like an onion (well, an inside-out onion). As players solve puzzles they get access to more and more of the ever expanding world. It's good for dramatic reasons, but also helps with focus and making sure they aren't overwhelmed with too many choices too early. Maniac Mansion had 36 explorable rooms, plus another 5 or 6 rooms for things like the title screen or the talk show set. 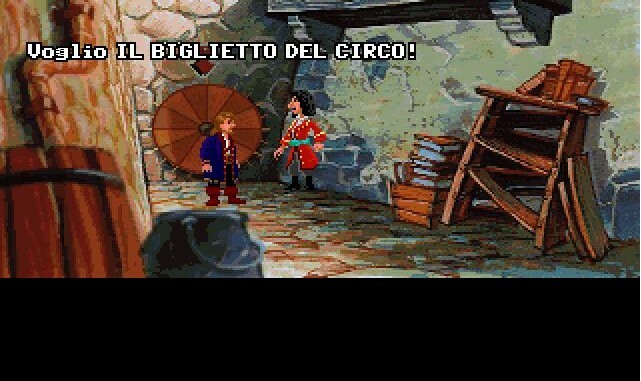 Monkey Island had around 70 explorable rooms and another 15 or so close-ups, title screens, etc. We've always thought about Thimbleweed Park being Monkey Island size in terms of the world, so we're shooting for 100 rooms and will probably come in at around 80 or 90. It's hard to tell at this stage. With Maniac Mansion and Monkey island, disk space was our number one limiter of size and with Thimbleweed Park, that's close to a non-issue. Our limiting factor will be the work involved in drawing and implement the rooms. The map below includes all the major locations, and some will grow by 5 or 6 rooms. For example, Delores' Mansion is 3 rooms on the map, but it will end up being closer to 8 or 10. The pillow factory is another that will expand dramatically, as well as the circus and the hotel. Now that we have a map, we'll start the process of adding, removing and editing. Some of these rooms won't make it into the final game because they'll end up being redundant, uninteresting, or the puzzle required for their existence was cut. Please note: as with anything you see on this dev blog, don't become to attached. It's also important to remember that these "rooms" scroll, so they can be, and often are, more than one screen wide. 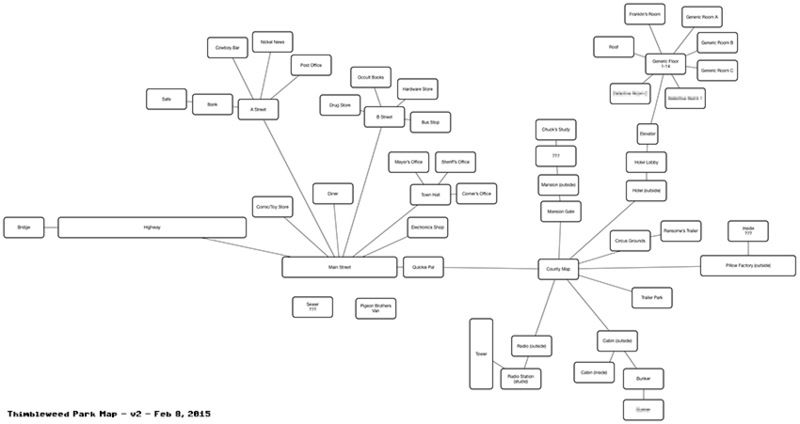 We've also done a few passes on the puzzle dependency chart. This is far from done, so it represents maybe 25% of the game. There are several disconnected nodes that will get hooked up as we figure out bridging puzzles and that will change the look and flow quite a bit over the next few weeks. Enjoy! My plan for next week is to have the core UI working, including verbs, and probably room transitions, and Gary's plan is more concept art while we both noodle away at puzzles. Will there be an actual top-view map as in Monkey Island 1 and 2? That's something that makes more realistic the world the history takes place in. I guess it all depends on how far the locations are, but it'd be very enjoyable seeing tiny detectives moving around maps. I remember being 7 years old and being able to stare at the MI1 and 2 maps for hours, imagining what would be in those non-clickable locations. Good stuff and thanks for the updates. They're much appreciated. Yes, we are planning on a Monkey Island style map of Thimbleweed County. I love maps. I hope the map will be a walkable birds-eye view, like in Monkey Island, and not an actual map with a bunch of click targets, like in Gabriel Knight. I don't know why, but to me, the Monkey-Island-style maps always make the games feel like real, huge, connected places, while the Gabriel-Knight-style maps make them feel like disconnected locations. Seeing the little guy walk through the huge world gives it a kind of weird verisimilitude, and a sense of scope. Yes, it will be like Monkey Island, where you see a little version of the character walking on the map. I completely agree with you that is gives a nice sense of scope and depth to the world. Walkable maps are indeed nice. A static map with only clickable places in it feels too much like a glorified list. Hmmm...A map of Thimbleweed County...A candidate for being the "feelie" included in the boxed edition? Or, is that too boring? By "boring", I mean "obvious". I was gonna write" I doubt he'll do it, because on the Kickstarter, Ron and Gary only promised a Box and that was it" but then I checked the updates and found out that there will indeed be a feelie in the package! I hope the map is what it is too! Are you handling a list of verbs already? If so, any verb new or removed from the list compared to your previous adventure games? I know everything is in the flux at this stage, but maybe having the list fixed is useful to develop the puzzles. Best puzzle on the chart: "Stuff ???" Actually, seeing the puzzle chart reminded me of something I wanted to ask you guys: Are there any plans to make some ridiculous "easter egg red herring item combinations"? You know stuff that is totally useless, but gives the player the feeling of "figuring out something" even if it has no use or value? "Room" makes sense to me. It's a level of abstraction that makes sense. Each location is like a room. Though a "room" might be outside, it essentially is a walled compartment with "doors". Even if you're walking in a jungle, the thick jungle vegetation serves as the walls; You are limited to using the "exits" (doors) to get from one location (room) to another. Seems like the adventure is halfway done. Set for a release date around March '15. 2015 that is. This is so much more interesting and fun to follow than what Doublefine did and I bet the game is going to be much better too. There is really a lot to be said for keeping things simple and flexible. I think this is a hangover from my Flash days... But I also really like the Movie/Stage analogy when working on games. Makes everything a little more tangible. Actor is so much nicer than RenderableEntity, y'know? Fascinating stuff. You seem to make a lot of progress in a short time - I guess that's the good part about the 80/20 rule :-) I love reading your blog and I am always excited like a little kid when I see a new post. That said, I sure hope you won't give away too many details. The last thing I want is to get my hands on the finished game in a year and a half, and there's nothing left to discover for me because I know everything from the blog. Then again, I am sure you guys are way too experienced to allow this to happen. I wouldn't worry about Gary and Ron giving away too many details; Many times they censored spoilers (which is the only type of censorship I condone), so they're conscious of what they're doing. Just to clarify, what is first? The room or the puzzle? Do you have a puzzle and you must find a room for it or do you design a typical town and try to find puzzles for this location? Either way. Sometimes we come up with a great location and it sparks an idea for a puzzle, sometimes we have a puzzle and it requires a new room. There is a danger is spending too much time on a map (rooms) without having puzzles, because you run the risk of having a pointless world. Leaving unused rooms are something funny to see after finishing a game. Please, don't remove them! I still remember the living room? bedroom? in the theater where Indiana Jones meets Sophia Hapgood. And Chuck the plant was there too! One question: Do you guys plan on having Thimbleweed Park feature any type of fast-travel system on the map screen for areas already accessible for a specific character when that character is standing outside? For example if you have already accessed both the circus tent and post office for Detective A, could Detective A standing from outside the Cowboy Bar "warp"to the outside of the circus tent from the map screen or would she have to walk (or drive...?) the entire distance? Or... would it ruin and prevent important "room" to "room" events from happening that are absolutely necessary for how the game plays. Or... are there taxis or can you steal the pigeon brother's van or anything like that (well if so i guess that'd be a spoiler so don't answer that, that's just me completely guessing lol). 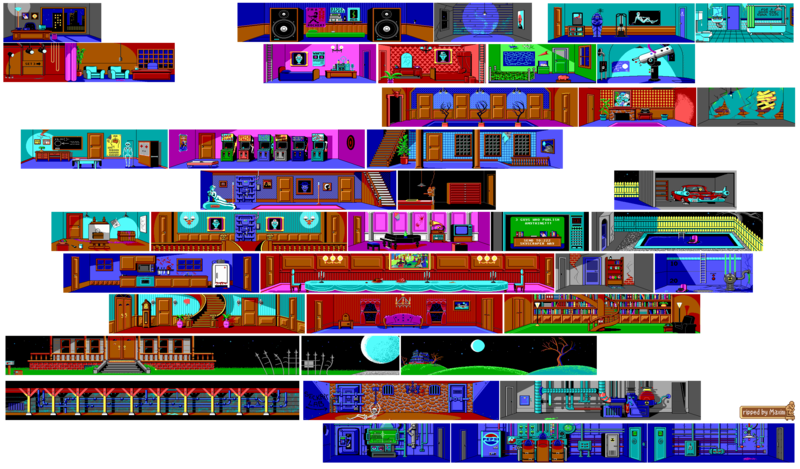 A fast-travel system in Maniac Mansion for example is something that obviously and absolutely would've been completely inappropriate and unworkable, not just because nearly the entire game took place inside of the mansion but as you went from room to room you could get caught, certain cutscenes would occur, you had a "hidden" time limit to do certain things such as to pick up the mail package at the front door, etc. etc. Oops, I meant "could Detective A from standing outside the post office warp to the outside of the circus tent" when that character has already accessed both areas. As Disk space is no Problem at all nowadays, I some sort of "secret location" could also be a nice thing. A "Room" which has nothing to do with the main game, but is just for fun maybe with some goofs or misleading hints. Ron - absolutely loving this developers' diary. It's something I've been wanting to read and follow along with for years! I suspect Monkey Island was quite differently designed than Maniac Mansion, though. In Maniac, that literally were rooms you got to explore, naturally. But there's more, and that's that a chunk of the supporting cast moved around them as well. This wasn't merely a collection of rooms, there was a sense of place as, for instance, if you rang the door bell multiple times, you saw Weird Ed actually following the correct route all the way to the main hall and eventually door. Never tested this, but if one of the three main characters stood there, I think they were captured as well. There were quite a few chunks of pseudo real-time tricks which for some reason have rarely ever been explored further neither by modern games nor sequels that followed, except maybe the vastly overlooked The Last Express. DOTT replaced that with a very different (time traveling) twist, but naturally in that game you weren't supposed to be intruders into the Edison mansion, but were helping Dr. Fred to save the World from Tentacle Invasion. Monkey 2 in that regard was equally much more conventional, but unlike standard adventure tropes still gave a very good impression that Le Ch. might actually be out to get you (even though he never did) by all the breaks that occurred and triggered cut scenes in his fortress revealing the plans to the player. By MI2, those were scripted and were triggered by finding map pieces in Chapter 2. In Maniac Mansion, this equally was pseudo real-time (I think one of the first actions of the NPC cast was Weird Ed going to fetch the cheese from the fridge -- if it was still there that is.). Looks good! :-) My favorit world map is probably the one in Super Mario World. Seckrit Question was wrong! Please try again! Are those graphs drawn manually, or did you use a tool? As flowcharts like those tend to be of use for any gaming project (with storylines and quests/riddles), not just adventure games, I'd love to learn which one you use. Thanks for the frequent updates! Luv them! Ron mentioned a couple of weeks ago that he uses OmniGraffle for those diagrams. I'm not sure if he places all of the boxes by hand, or whether it has some special mode that lets you create the nodes and then it flows them and lays them out automatically (I've not seen it do that, but then it's not really something I've needed to do). Hey, thanks for letting me know about OmniGraffle. I must have missed that one. With regard to the use of the term "room" to describe a game location, it certainly pre-dates Manic Mansion as I played MUD in the 1980s and it was in use then - as that was begun in the 1970s I always presumed it goes back to the earliest roots of text adventures like Colossal Cave. Keep up the excellent work with the developer's diary and indeed with the game - I'm very much looking forward to it! One of the thing I love the most about Zack McKracken is the possibility to achievers house by pursuing different ways. You can flush the fish, or you can grind them in the faucet. you can pay the phone bill or you can pretend to be an alien. It's a bit openworld-like sort of thing and we all would really appreciate if it could be applied to this game. Yes, that's why I loved this game, above all the others! Becuase it's not a straight line, but a open world. I think you should blur out the puzzle charts (or have some other mechanism to hide it). There is infamous saying "Design by committee" and I don't think adventure game puzzles can benefit from it either. So feedback on your puzzle chart would be useless. Big parts are already blurred. There are no real spoilers. Also i doubt there will be much impact to the actual puzzles by user commentaries. Adding some puzzle charts beefs up the read though. Did I happen to mention that while I don't pre-order games, big boxes with cloth maps (or maps on back of a t-shirt) are an exception. Right now the kind of $$$ you were asking for big box is out of my range but that could change within a year. These blog posts are so great - I know it's doubly hard to create something AND document it at the same time, so thank you for taking the time to share this stuff. I just read the Maniac mansion design doc... almost 30 years after it's first printing (wow), and I realized that we never had much vertical scrolling in Adventure games. It'd be nice if there was a way to work that into Timbleweek Park! Yep! We have several rooms that will vertically scroll. One is climbing the radio tower at the local Thimbleweed Park radio station.